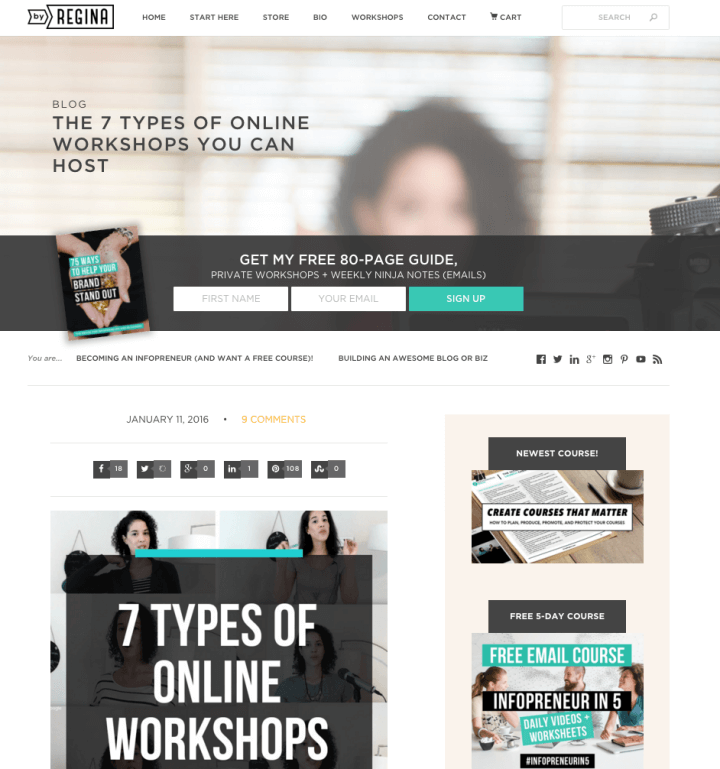 Do you want to learn how design, branding, and marketing can make your new website or your blog stand out from the rest? If you do, then read on my friend. So, you have a brand new website ready to be rolled out for all your new and prosperous visitors to come and see. However, you feel as if you’re staring at a blank canvas. I mean to say, you have a website that looks OK and everything, but it kind of looks plain and ordinary. There’s nothing that really makes it unique, or stands out from all the other websites out there. Now you’re thinking about branding and you really want to create something special and memorable. 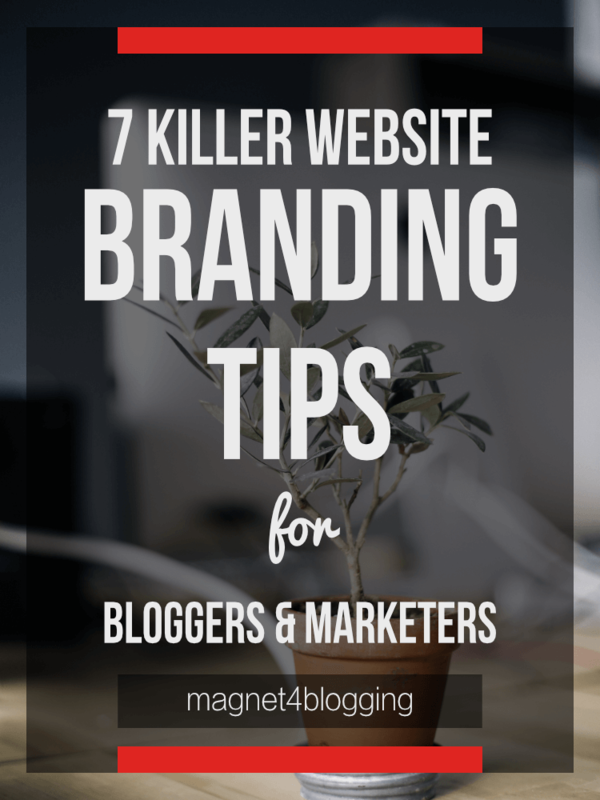 Well, right here is where you start, because, in this post, I’m going to share with you 7 killer website branding, design, and marketing tips that will help you become epic. Moreover, these are simple things that you can do right now. OK, so what I want to do is break this post into two sections. We’re first going to look at website branding in design, then we’re going to look at branding in marketing. Let’s get stuck in. When it comes to designing a standout online brand, there are a few things you need to keep in mind to stop you from going off the rails. But hey, don’t panic yourself. Even if you’re completely new to branding in design, you will be fine. You don’t need to have a degree in website design to successfully create something unique for your brand. Like I said these are simple things you can do yourself. What kind of style do you want your website to have? This is not a technical question, really, because having a style or theme that is personal to your brand is what will help you make your website stand out and become memorable. For instance, if you take a look at ByRegina.com, her site has a very “personal”, clean, modern, and fresh look and feel to it. It’s really lovely. See screen captures of both these websites below. The other important ingredient required for creating a memorable online brand for your business is not just creating something that looks great, but also something that is going to reflect your personality and individuality. Your brand style needs to say a lot about who you are as a blogger, business person, or entrepreneur. And, it has to be something that you absolutely love as well. When thinking about creating a unique style for your online brand, you have some options. You can either hire a graphic designer to help you bring your visual ideas to life. 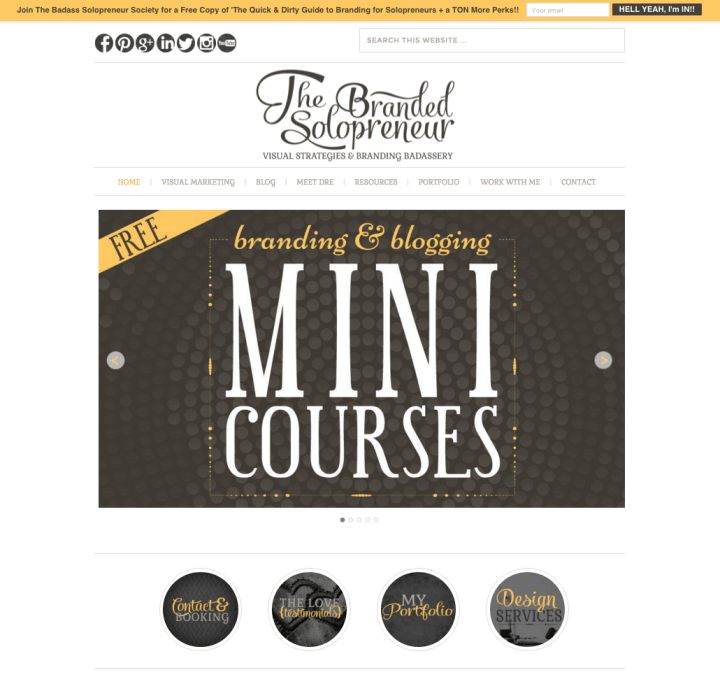 Or, learn how to use some of the amazing tools available to build a branding package. The next step is picking out some colors to complement your brand style, in this instance, your website colors. Now, I only speak from personal experience here, however, I think flooding your website with all the colors of the rainbow is OK if that’s your kind of thing. But, more often than not, this can create some unwanted design clutter. Three tones, or less, work very well in modern website design. 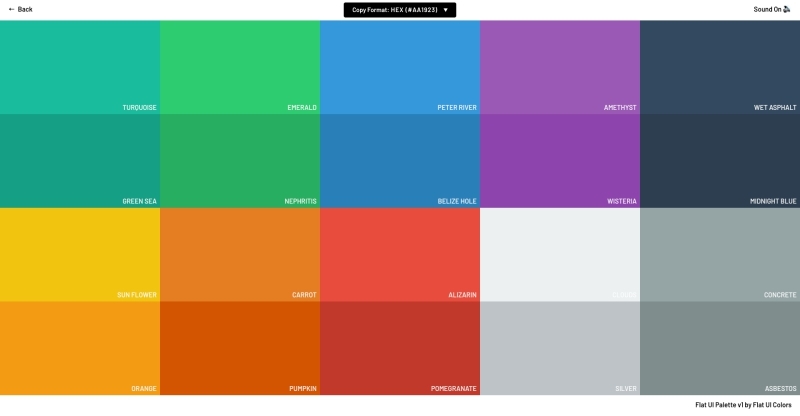 For example, Magnet4Blogging’s design uses a palette consisting of two primary colors on a neutral background. The colors are red (#ed3330) and dark gray (#494949) throughout. The accent color is slate gray (bluish grey). Take the time to select your brand colors. Use psychology to determine which colors would make a positive impact on your brand and type of audience too. Another critical element of your website branding is choosing the right typography (typeface and color) to match your website design. Now, if you think about this very carefully, often, regardless of the style or theme you might be using on your site, the moment you change the typography element it instantly transforms the overall design, looks, and feel of your website. When customizing the typography it’s important to think not just from a design perspective (what you think looks great), but also from a user’s perspective as well. 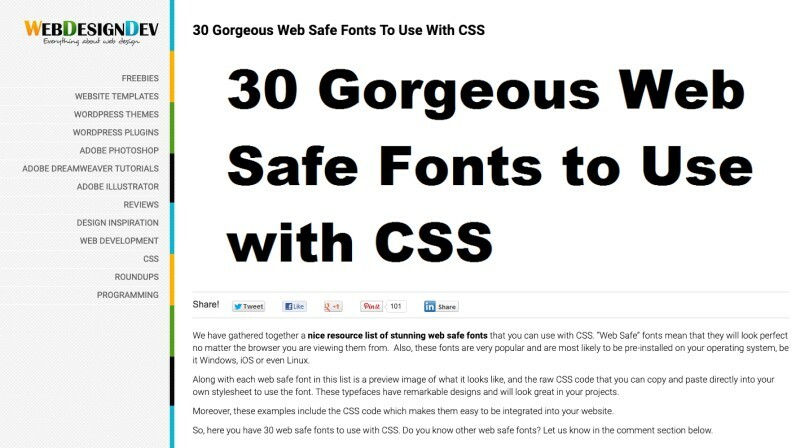 Where ever possible try and use “web safe fonts” that your readers will find easy to read, as well as fonts that will complement the design and style of your brand. You’ll find some inspiration here. Now, just as style and color are important, so is the layout of your site. You have some choices to make whether you want a compact looking site where all of the elements are packed tightly together. Or, you want to create lots of white space between your elements, content, images, graphics etc. In other words, have a clean, modern looking layout. 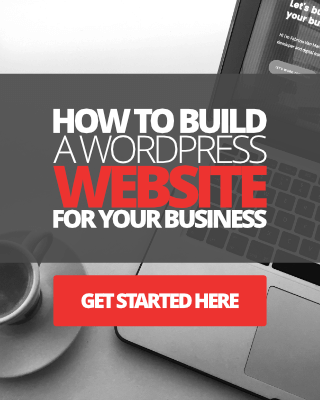 Once again, speaking from personal experience and working with many web design clients regarding this issue, the core message or value proposition of a website can sometimes become diluted when there is too much going on, or when a website looks too busy. 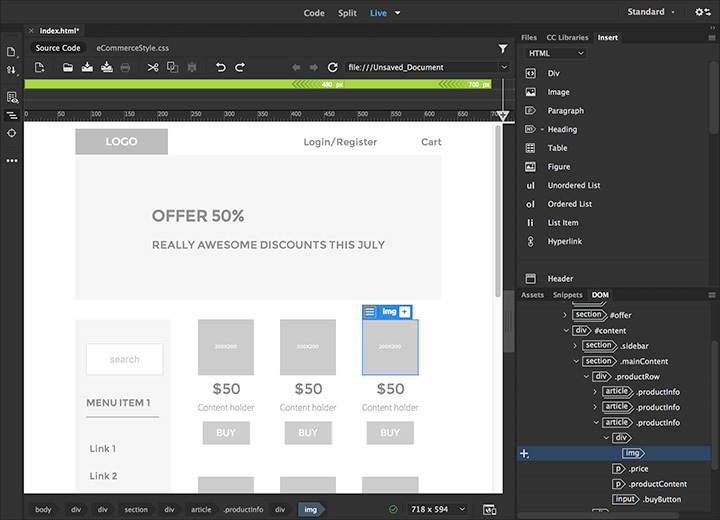 Creating a balanced layout is very important, again not just from a branding or design perspective, but also from a user’s perspective as well. OK, so we’ve looked at some branding design and style tips, but visual design is just one area of creating a memorable online brand, right? Let’s now look at some marketing objectives to help you increase brand awareness for your website or blog. Here’s the thing, it doesn’t matter how great or appealing your website looks. Or, how wonderful and eye-catching your logo is – If your UVP, and, your marketing message isn’t compelling or clear enough to your website users, folks will simply leave and probably not come back. When someone new comes to your site, sure it might take them a few seconds to get their bearings, and that’s natural, we’re not machines. But, you can assist them by ensuring that you have a clear message and a unique value proposition, something irresistible and compelling enough to entice their interest a little bit further. “What is this website about and is it for me? Most people come to a website or visit a blog because they have a problem that requires a solution. So, make sure that your message is clear about the value your website, content, products, and services has to offer. David Hartshorne from AzaharMedia knows how to attract his ideal customers through smart and concise messaging. With the right message and in time, your brand will strengthen, and folks will know exactly what they can come to your site for. 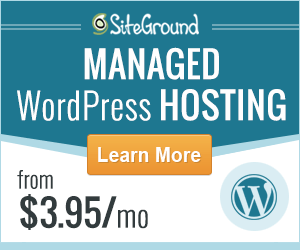 So, you have a great looking, user-friendly website with some beautiful branding. Your message is clear and you have a killer UVP. It’s now time to back it all up with some rock-solid content. Creating great content is the key ingredient to your brand’s recipe for success. Content is the core of your marketing efforts, it is what will help get your brand noticed online. It’s also very important to ensure that your content always remains 100% aligned with your message, your UVP, etc. And, when we talk about creating content for your website, we don’t just mean writing a couple of blog posts every now and then. We mean using every available medium and format to create content that will convey our brand’s message to your audience. Here’s a useful link to a post sharing 12 amazing tools for creating beautiful online content. 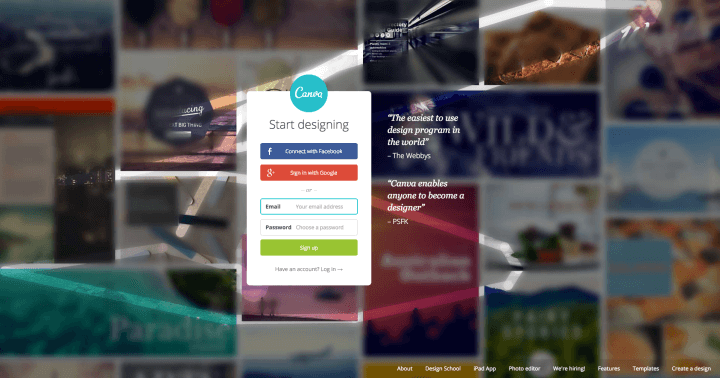 Canva is just one of those wonderful online tools you can use to help you create awesome content. Finally, if you’re incorporating blogging into your content marketing strategy (which, of course, you should be), then developing a unique persona, a writing style or tone of language, will help you create an online brand that your audience comes to love, trust, and keep coming back for more of. So hopefully I’ve been able to share some valuable thoughts, tips, and advice for you here when thinking about branding your website or your blog, both in design and in marketing. None of this is rocket science, folks. Branding doesn’t have to be complicated, it should be exciting and rewarding. Sure, it does take some time and a bit of hard work to make it work, but it’s worth every bit of your precious time. Let’s get your business rocking online! I can help you grow your business with smart, conversion focused, growth-driven web design. Let’s work together to create a personal brand website that will put you miles ahead of your competitors! To find out how, click here. Thank you so much for this informative post. Lots of things to read and check with the connected links you’ve given. I am sure this will present me with some new experiences in my blogging journey. I am bookmarking it for future reference. Keep sharing and Thanks again Fabrizio. Hey Philip thanks for taking the time to read and comment, I appreciate it and I’m happy to hear you found the post useful. Glad to be of help mate. Have a wonderful week ahead – Fabrizio. Well there are some people who still just don’t know what they want. I have to laugh because I’m one of them. As you know, I finally got my new theme but I’m not consistent yet with my images or color because I only go so far and then I hit a wall. I just can’t make up my mind but it’s SO important too so I’m glad you pointed all of this out. I’m still trying to figure a few things out so I hope that those who have it together can easily follow everything you’ve shared here. It’s not easy task getting everything in place but it’s a necessity if you really want to stand out. Really great share my friend, thanks for that. Hi Adrienne, thanks so much for your comment and being honest. I definitely know where’ you’re coming from because a lot of the times although I know what I’m looking for, I’m always indecisive about things, especially when it comes to design. That’s one of the reasons why I decided to take a step back from blogging all too frequently to focus on getting this right once and for all. Your site looks great I have to say, it still feels familiar, but with a more modern fresh look. As far as branding colours and design style goes, you’ll get there, like I said these things take time to craft, and for sure it’s not an easy process. All the best Adrienne, so love seeing your comments here 🙂 Makes my day. I just redesigned my site and the feedback I’m getting it outstanding!!! I really love the professional and polished feel; especially since my audience tends to be more high end entrepreneurs. I really appreciate you including me in your post. The reality is that ones message is the absolute most important thing… the message will ultimately dictate the layout of a website. The reason is you want to be able to deliver a clear, concise and relevant message for a specific audience and the layout is the means to do that; and as you know ones industry, purpose for the site (ie information, education, marketing, ecommerce, etc) and a few other factors inform it. Great post Fabrizio and again thank you for including me! Don I love the homepage of your site now, I really do. Love the fact you’ve incorporated your call to action inside a button. I use something similar on my homepage with “work with me”. Anyway, glad you’re getting some awesome positive feedback my friend. You are the master when it comes to clarity and message in online business for sure Don. Thanks to you and a small handful of other fine marketers out there I’ve been able to incorporate some of that into my own business. 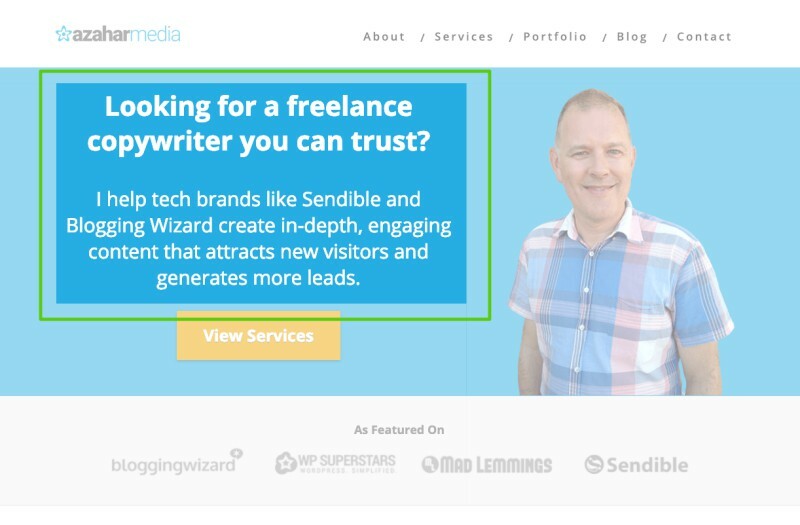 The problem I find with a lot of bloggers and entrepreneurs is that they have way too much going on on their homepage. It’s like information super overload, especially above the fold where I see most of the space being cluttered with crap, and often the message gets lost. Have a great rest of the week mate 🙂 Hope some of the snow has melted now. Love this practical post of yours. I must admit I am hopeless when it comes to blog design. I know what looks good but have no clue how to create a nice looking site for myself. While I neglected color and typography previously, I recognise now that they are important issues, at least from a branding point of view. Design wise, I’ve noticed that a lot of websites that use themes such as Thrive have a sameness about them. Structurally they seem to be more or less the same as each other. From a differentiation point of view, this is a concern. That said, your two examples look great – and unique. Just like your blog! Regarding the issue of messaging, even if a site owner doesn’t have a blog there is a lot they can do to develop and articulate a potent message for their audience. Sometimes I visit websites that look great, but their messaging is lame. It’s pathetic. Whether it’s the home page, the about page or the testimonial page it is critical to get the messaging right. Bottom line – it doesn’t matter how beautiful a site looks, if the messaging doesn’t hit the spot with site visitors, conversions will tank, and the site owner will be forever complaining about all the money he spent on a non-performing website. Hi Kim, thanks for stopping by hope you’ve been keeping well buddy. You are spot on my friend, yes I couldn’t agree more about the “message”. I’ll be the first to admit that when I got started with this blog some years back, I don’t think I took this seriously enough. I’ve always gone by the concept of “hey if you like my stuff then that’s cool, if you don’t then tough”. 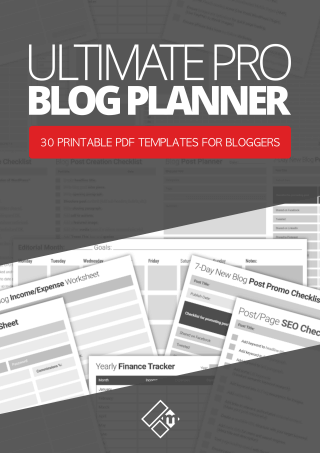 But as I started to look at blogging as a business, I started to become more specific with my message and put some clarity into perspective with design. Everything changed and suddenly I was getting more visitors, more subscribers, more affiliate conversions, sales and more clients coming in the door. Before I came to know of Thrive very few were using it, but like anything these days it became popular. 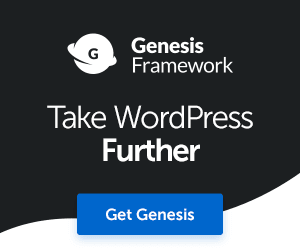 Like Genesis, I loved Genesis and had been using them for years, until I got fed up with the fact that almost every other blogger was using the same theme. The great thing about Thrive is that they have some swell customisation and front end tools to really help you create custom pages, and with combined with my own design elements and some fancy code work I was able to create something a bit more unique for brand. Thanks again Kim and have a super weekend ahead. Loving this Blog Post Fabz. Definitely agree with Kim#2’s perspective on having the right message on your website (this is super important). I’m so glad that I have finally gotten on the right track with this…. because it has truly made a hugeeeee difference. The two brands that you mentioned in this post Fabz, Regina and Dre’s brands are totally rockin it out online. Grant it, they do also have powerful messaging to back their brands as well.